In 1871 the town fathers decided it was time to stop wetting the horses’ tails and ordered an iron bridge to span the river at this point. I think the bridge was built by a company in Fort Wayne, as the Wabash Bridge and Iron Works was not in business yet. It is interesting to note that the North Manchester Covered Bridge was erected by the Smith Bridge Company of Toledo, Ohio, at the east end of town. What were the city fathers thinking when they ordered an iron bridge and a wooden bridge to be built at the same time! Well, we all know the wooden bridge did survive. Back to your story, Miller. In the 1920s that bridge was part of us boys’ who lived in the west end of town. On the north side of the river, below the dam, was the sand bar, and it was here on that sand bar where we boys would swim, sometime skinny, sometimes BVDs. On the south side of the river were the good fishing holes below the dam. Our outdoor gymnastic playground was that old iron bridge. Of course, it was summer time and sun beat down. The floor of that bridge was covered with thick tar to protect it. Somebody wants to know when the covered bridge was built that is still in use across Eel river at the end of Wabash street. This old bridge has had a little more than fifty years of service, and will be good for much more if given some attention where needed. It has had to be refloored several times, but after all it has probably given more real service than a great many of modern steel bridges have ever been able to give. This bridge was built in 1872, and was erected by the Smith Bridge company of Toledo, Ohio. Because the county records at that time were not all indexed it was impossible to find the price that was paid for this bridge without hunting through many pages of records. However, a pretty good idea may be had from the price that was paid for the covered bridge at Liberty Mills. That bridge was built one year later by the same company, the contract for it being let April 23, 1873, and the specifications being identical with those of the North Manchester bridge, excepting possibly a little difference in length. The contract for the stone work on that bridge was let to James M. Furrow and Samuel Smith for $8.50 a cubic yard, while the bridge contract was let on the same day to the Smith Bridge company of Toledo for $18.50 a lineal foot, the bridge being about 190 feet long. This would indicate that the bridge exclusive of the abutments cost about $3,515. The iron or steel bridge across Eel river on the Wabash road, southwest of town was built in 1871, the contract being let May 26 of that year, though it was quite late in the fall before it was completed. The price for this bridge was $26.25 per lineal foot, and the contract was let to T. B. White & Son of the county of Beaver, Pennsylvania. It is said the iron work for this bridge was the first piece of freight hauled to town on what is now the Pennsylvania railroad, which at that time was not completed farther west than Main street. Prior to 1872 there were a number of different bridges across Eel river where the covered bridge stands today. No one remembers when the first of those bridges was built, or very much about any of the others that followed. It is known that at one time there was a two way bridge there,--that is a double track bridge, and it was probably the one that was immediately followed by the covered bridge. There used to be a ford below the bridge that was used when the bridge was out and the water was not too high. There was a sort of temporary foot bridge of poles and logs across the river there while the covered bridge was being built. Thomas Hanley recalls cooning his way across that structure one morning when on his way to Warsaw. Tom was but a lad at that time, and that was his first trip out into the world. It was during the campaign when U.S. Grant was candidate for president for the second time, and there was a big rally being held near Warsaw, out at what is now Winona. Though but a boy he was big enough to march in the parade. The uniform consisted of red flannel pants, white shirt and blue cap, together was a coal oil torch. Dressed in this outfit Tom felt just as big as anybody, but while waiting for the train he shrank considerably. Saloons were plenty those days, and even some of the republicans were not averse to taking a little of the democratic platform internally. The crowd marched into a saloon on the south side of the street, and Tom went along, not that he was particularly thirsty, but boy fashion, not wanting to be left behind. He thinks it was Fred Green who looked at him, and said: “You look pretty young to me,” and motioned him to the door. There were others in the party who would have benefitted had the same order been applied to them, for there were a few who could not have cooned the log across the river when they arrived from Warsaw. Those were the days when at a political rally most of the marching had to be done in the morning, for by night it was pretty hard to keep a lot of the enthusiastic ones on a straight line. While Peter Ogan must be given great credit for his foresight in platting a pretty and convenient town the same cannot be said of the people who planned the bridge system. There is some doubt, in fact, whether there was ever any plan at all, it seeming that our bridge builders just stuck the bridges any place that was handy. Suppose that what is now the Second street bridge had been built at the east end of Main street, and the Light Harness pike continued just a little farther to the east and brought around to that bridge. One bridge then would have given the service that two give today. Then if some day when the water was high one of the early settlers should have hitched his oxen to a plow and cut a few furrows from about where the covered bridge stands today over to Pony creek we would have been rid of the river bank in the business part of town, and would not have needed the Market street bridge. But they did not do this, and we will probably have to go on keeping up three bridges when one should have done the work, and we will have to defend the south side of Main street from a river that might just as well have been a quarter of a mile or more away. Old timers tell of a bridge that was once planned to cross the river just south of the Harvey Cook home, northeast of the college. That must have been in an early day, for the story only comes as a sort of a tradition, Thomas and Wesley Cook having told of it as happening when they were young. It appears that a considerably amount of timber was hauled there for the purpose of building a bridge, and then suddenly it was all hauled away, a number of ox teams appearing and dragging the timber to some other place. Here is a chance for the real old timers to recall a story, for the Cook brothers were never able to learn how the bridge came to be planned there, or how once planned, the lumber was taken away before it was built. The old suspension bridge had its part in boosting the Riverside addition, having been built in the later eighties by Macy Good, as has been told before in these sketches. It gave place about 1895 to the steel bridge across the river at Market street, that being built while Michael Snideman was county commissioner. The concrete bridge across Eel river a mile or so west of town, on state road 27 was built in 1914, but was not opened for traffic until late that year or early in 1915. It was built at a cost to the county of about $10,500. At the time it was built there was a great deal of comment to the effect that it was not greatly needed, and as a matter of fact it was not used very much for a few years. Then the state road was mapped over this bridge, and a great deal of through traffic goes that way instead of coming to North Manchester unless there is an especial reason for its coming here. There used to be a time when it was thought the thing to do was to attract all possible traffic through a town. Now there are many places that are seeking to keep some of the traffic off of the streets—to have main roads leading near to the town, but not to attract through traffic just for the purpose of having many cars pass over streets that are already crowded. So possibly it is just as well to have the state road near us, but not right through town, and the bridge that was once considered as not necessary has come to be a convenience. When it was built the argument was that many people to the north and northwest needed it to drive over as they hauled tile from the Giek mill, but the mill is gone, and there is no longer any tile being hauled that way, so it remained for the automobile to bring more use for the bridge. This bridge, too, shows that where it is possible to build one a concrete arch is the most durable. While in this case there was a part of the cement work that possibly was not up to the desired standard, yet the main part of the bridge bids fair to stand usage for a long time. Particularly is the concrete bridge to be recommended because it does not require a new floor every few years. When was the iron bridge built on East Second street? And when was the iron bridge built north of Liberty Mills? Are questions that have been asked of the old timers, and the range of dates would surprise you. The time is set all of the way from twenty to forty years ago. Men remember of these bridges as they were built, and of the time when there was no bridge at these places, but can’t for the life of them tell the years they were built. It seems probable that the very late eighties, or possibly in 1890. At this place in Liberty Mills there had been some wooden bridges built on piling but the high waters would come along and wash them out. Stephen C. Ulrey, father of Jacob Ulrey of this city, lived at that time where John Foulk lives today, northeast of the end of the bridge, and he headed a contingent that asked for a bridge that would stay there longer than the old pole bridges. 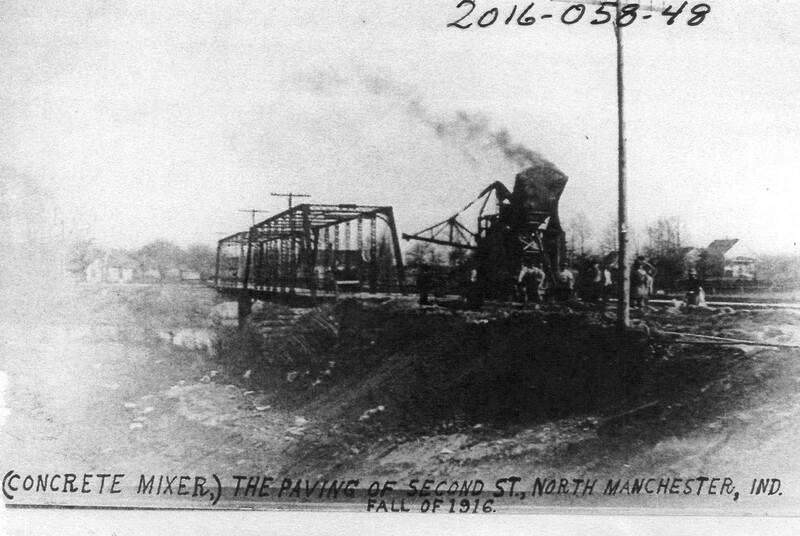 At the same time there was a movement to have this bridge erected on the county line between Wabash and Kosciusko counties. Just why one place was chosen instead of the other is not known today, and even yet there are people who will argue each way on which was the most desirable place for the bridge. Had this bridge been built on the county line a road would probably have been opened all the way through on the line between Wabash and Kosciusko counties instead of there being a space today of two miles or more without any road. But there is a question whether a road through there would have been used a great deal after all. So there you are. The Second street bridge was built in the later eighties, probably about 1889, and was the result of a demand from people living north and east of town. Until then they all had to drive down the river and come into town by way of the covered bridge, or the bridges that were there before that time. The road around there was paved with nothing much but mud holes, and it was a long weary trip around that way for the loaded teams or even for the pleasure vehicles of those days. So the petitioners found favor with the county commissioners, and the bridge was built. About the same time a bridge was built across Simonton creek, north of the Clevenger corner. The Second street bridge over Eel river in this city is said to be in bad repair if not in an absolutely dangerous condition. The county surveyor was over Saturday and inspected the structure in order to make a report to the county commissioners of the condition of the bridge. It appears that when this bridge was built several years ago the approaches were filled in against a wooden frame work which has rotted away and the roadway leading to the bridge is liable to cave in at any moment. Also the columns on which the east end of the bridge rests have settled out of line considerably, rendering the structure dangerous to a certain extent. From all reports it appears that the bridge is fast getting in a dangerous condition and the county commissioners should take some action toward repairing it at the earliest possible time. The 2nd Street Bridge was a double-span bridge. In the Fall of 1916, paving was accomplished with a steam-powered concrete mixer.